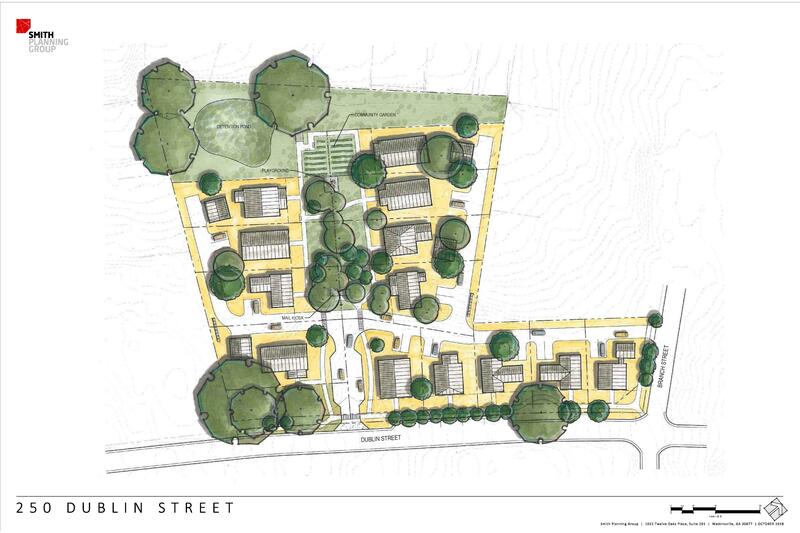 Smith Planning Group submitted a proposal to develop a three-acre lot in East Athens to build 13 new homes, three of which would be considered affordable housing and developed through Athens Land Trust. This new development proposal, which would be built along Dublin Street, raised concerns among some residents of the area. In response to the concerns, Mariah Parker, the Athens-Clarke County Commissioner for District 2, called a community meeting where Bob Smith, the founder of Smith Planning Group, presented the proposal and discussed any concerns. Why It’s Newsworthy: This development, if passed, would increase the number of affordable homes available in Athens-Clarke County. This rendering shows the proposed development along Dublin Street by Smith Planning Group. The rendering was provided by Smith Planning Group. The main concern of the residents was two-fold: the use of Athens Land Trust to develop the affordable houses and the affordability of the 10 remaining houses in the lot. Bagby’s experience with Athens Land Trust extends through her daughter who went through the process for about 10 years. However, Heather Benham, the executive director for Athens Land Trust, said the situation described by Bagby needs to be put in context. “In our experience, working with that individual and that family, we don’t have the same understanding of the situation,” Benham said. Also during the meeting, Parker asked the 50 people in attendance if they knew of an alternative that could provide affordable homes, but there was no alternative offered. Smith Planning Group opted to use Athens Land Trust to develop the three affordable homes in hopes of long-term affordability for those homes. “As far as I understand, the Athens Land Trust is really the only organization that has a mechanism in place to provide and keep an affordable housing stock over time,” Smith said. Nikema Stovall, an attendee not from the area, supported the use of Athens Land Trust. He argued, during the meeting, that the residents should support being able to get the three affordable houses, knowing they would be affordable, rather than send the offer away in favor of a new development with no affordable properties. According to Benham, Stovall is not alone in his support of the use of Athens Land Trust for affordable homes. The proposal will go before the Athens-Clarke County Planning Commission in January. If it passes, the proposal will go before the County commissioners and the mayor in February.